Or tv shoot! Who knows. I didn’t write it down and I’ve already forgotten what was shooting here. 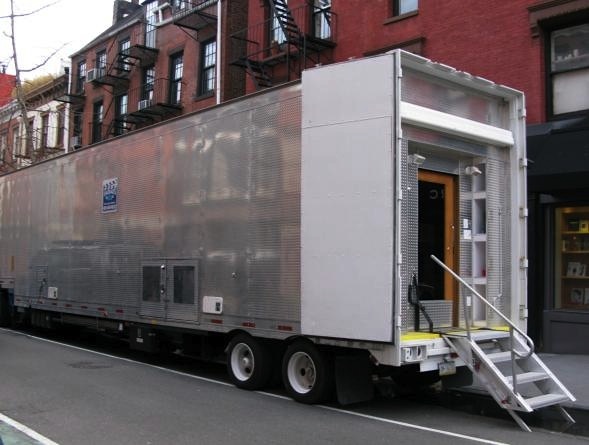 I just took a picture of this trailer parked on Bleecker Street because it was one of the biggest and fanciest I’ve ever seen. When I was in my twenties and I passed by movie sets I’d fantasize that someone would come running over and say something like, “Please stop! You have just the look we need! Would you please be in our movie?” And so I’d be discovered. That’s exactly what happened to me, July 11, 2007. Walking down Lenox Ave., some guy gets in my face and dragoons me to extra in a Frank Langella movie. I sat and watched the man work for 4 hours, from 5 feet away. Bottom line? The scene was reshot at another location. I wound up on the cutting room floor. Show biz. And I was supposed to get $100 and they never paid me! I have very bitter feelings toward Hollywood.